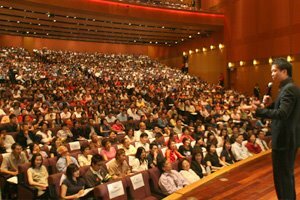 Since I did not attend Joey Yap's "Thriving In Challenging Times" Feng Shui and Astrology seminar last Saturday, I had to rely on my brother who went for the whole day talk at KL Convention Centre. I hope his notes are correct, otherwise I may be giving you wrong information! Anyway, to start off, I would like to first highlight about the Solar Eclipse that is going to occur on the 22nd July 2009. Joey Yap mentioned that it is crucial that you do not expose yourself to this eclipse on that day, or bad luck will befall you! It seems that if you are exposed to the eclipse for 1 minute, you will get bad luck for one full year! And if you are exposed for 2 minutes, you will experience 2 years of bad luck, and so on. I heard that this solar eclipse will be the longest total solar eclipse in the 21st century and will last up to 6 minutes and 39 seconds! Now if Lillian Too were to say this, I would have just taken it with a pinch of salt. It does sound a little superstitious, don't you think? I don't know about you, but as this came straight from Joey Yap's mouth, I am going to take his advice seriously! So if you don't want to go through bad luck for the whole year, make sure you note down the date of this eclipse. Circle it on your calendar. Save the date in your handphone and set the alarm to ring on that day! Do whatever you must to remind yourself of this solar eclipse! Of course, there will be sceptics who will ridicule this. Well, to all you sceptics, I dare you to go out there and enjoy the eclipse on the 22nd July and tell me you have a fabulous year. OK? Report back to me by the end of 2009 in time for me to wish you A Very Happy New Year 2010! Date selection is very important in feng shui, and especially to the Chinese. We have good dates to move house, get married, start an important project, even go travelling. According to Joey Yap, these are the bad dates to do anything important in 2009. That means do not start an important project, hold an important meeting, start a new job, go for an operation, do renovation, and even get a divorce on these dates! For bloggers, do not start a new blog on those dates! Anything that you consider important should not be done on the above dates and times. So, again, mark these dates in your diary or calendar so you don't forget! Notice that 31st January 2009 is the sixth day of Chinese New Year. That means, it is not an auspicious day to start work after the Chinese New Year celebrations! Please note that the animal signs is not your animal year, but the animals found in your Bazi Chart. To get your personal Bazi Chart, go to the Bazi Calculator in Joey Yap's website here. Just register yourself, and then enter your date and time of birth. 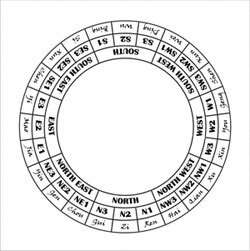 Please take note that your Bazi Chart is a very important Chart and you are to keep it under lock and key, and not simply reveal it to anyone. Perhaps USA President Barack Obama knows about Bazi because he never reveal his true time of birth. A check on the Internet came up with different time of birth on different sites. Because of this, we will never get to know his Bazi Chart and as such, his enemies cannot take advantage of his weaknesses. Now, ain't he a smart President! Your Bazi Chart may look something like this. Notice the name of animals in the Earthly Branches. 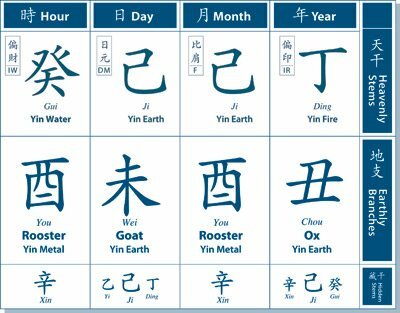 So for the person with this Bazi Chart, he or she should not start work on the 30th January 2009 because there is both a Rooster and an Ox in his Chart. By the way, the above is actually the bazi chart of the late Hong Kong billionairess and Asia's richest woman, Nina Wang, taken from Joey Yap's blog. How Joey interprets her Bazi Chart will make interesting reading! In feng shui, we must know which sector of our homes or offices that need to be activated to bring in wealth luck and other types of luck. If let's say, the east sector of your house has the wealth star this year, but that room in the east sector is a store room and is seldom used, then my friend, you just missed all the wealth you are supposed to get! So what must you do to activate that wealth star? Simple! Just move the furnitures in that room, or redecorate that room or make a lot of noise in that room! Use that room often and not keep it locked. This will trigger off the wealth star and activate it! In other words, when you move the qi or energy in the room, you will activate the wealth star. According to Joey Yap, you will need to activate the South East sector (or more specifically SE1) on the 31st March 2009 7am-9am except if you have a Snake in your Bazi Chart for your wealth luck. Or you may activate on the 3rd of June 2009 7pm-9pm except if you have Rooster in your Chart. So take note of these dates! If you are unsure where is SE1, please refer to the compass below. You can superimpose this compass onto your house' floor plan for better accuracy. So if you do not have a Snake in your Bazi Chart, then on the 31st March 2009, between 7am-9am, go to the SE1 sector of your house or office and move the furnitures around, or do some redecoration! If there's a garden outside your house in the South East sector, you can put up a water feature there. Any water features can help to activate your wealth luck, but it is best to place them outside the house, not inside. However, be very careful where you place the water features. If you place them at the wrong place, you may accidently activate the bad stars! How you activate the good stars is the same as how you activate the bad ones! With this in mind, make sure you do not do anything to activate the Five Yellow in the North sector. To learn more about the deadly and most feared star called The Five Yellow, read my Ultimate Feng Shui Test. If you want help from people or Noblemen, then you must activate your Nobleman Star at the North East sector (specifically NE3) on the 10th April 2009 5pm-7pm except if you have a Rabbit in your Bazi Chart. This will ensure you have unexpected help from people whom you may not even know! If you want to attract potential mate, then activate Peach Blossom Star in the S2 corner on 19th March 2009 between 11am-1pm. But better not do this if you are married unless you want to look for trouble! Besides the above, Joey Yap also gave an overall view of the coming Year of The Ox. Economy the world over will not be strong. It is best to undertake long-term planning instead of thinking about short-term growth. Industries that will do well are Academic, Education, Agriculture, Farming and Health. Where property is concerned, there will be less buying and selling, and there will be a surge in property rentals. Health problems will increase, especially those related to food poisoning. There will be lots of internal disputes in companies and organisations. Well, there you have it! My report on what Joey Yap said in his recent seminar. Hope I've provided you with some useful information so that you can avoid the bad and attract the good. Have a wonderful weekend and I would like to take this opportunity to wish all my Chinese readers Gong Xi Fa Cai and a Very Happy & Prosperous Chinese New Year! Just looked at that last bit...the predictions for next year. I would think it's pretty obvious...??? Would be interesting if you can show what he said last year about the Year of the Rat...and see how much is accurate. This is a lot of info to digest. I need to re-read this again. With regards to the eclipse in July, does this mean no matter where you are in the world, it's better to stay indoors? I will definitely do that and take note of the date and make sure my family and I are indoors. There's no harm in doing it. :o) Better be safe than sorry. What he said about the industries which do well seems practical as these are critical sectors which people will need. Anyway, before I forget.. Wish you and your family.. 恭喜发财!! babette, yes no matter where you are in the world, do not get yourself exposed to the eclipse. Yes, no harm in doing it since the eclipse do not last the whole day. Interesting... hope can see that eclipse. Haha. You're welcomed, I knew them well, both JY and LL2 - so will share with you guys some hidden stories ok!? I think you can find his past years predictions here.